This chief Pharmacist’s Mate’s Geneva Cross is accented with a bullion thread outline. Beautifully stitched with metallic thread or wound-metal elements overlaid onto crows, bullion navy rates have been in existence for more than a century. By 1913, the U.S. Navy’s uniform regulations established that rate badges with gold stripes (for dress blues) be accompanied with the eagle and specialty mark to be made of silver bullion. Uniform regulations regarding bullion were further expanded providing that all dress blue chief petty officer rates (regardless of the chevron color) would be constructed with silver bullion. These regulations, in my opinion, facilitated the establishment of one of the best aspects of enlisted uniform adornments. These fantastically embellished crows historically incorporate multiple shades or tones of silver, and at times, gold bullion threads in their designs making for highly detailed and textured rate badges. Along with aesthetics, the bullion crow designs take on a three-dimensional feel and are really quite stunning. Crow designs are substantially varied in their appearance based upon the time period in which they were made and the manufacturers’ interpretation of the design specification. One can examine two bullion rates from the same period and note that they will have different embroidery patterns. Thread direction will differ as well as the pattern used for the specific elements. A nice example of a humble Machinist’s Mate bullion design. This post-war Chief Boatswain’s Mate crow-design is subtle and showing some signs of wear. 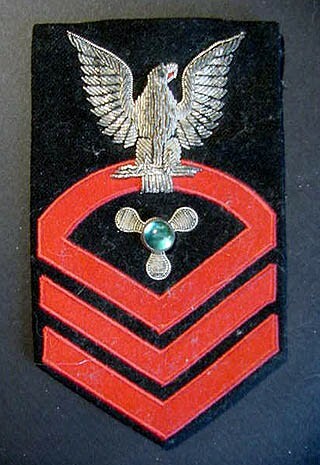 This Radioman Chief’s eagle is accented with gold thread on the leading edges of the wings. This red-on-blue chief aviation radioman is a recent acquisition. It appears to be a mid-1940s-era badge. This rather sloppy Radarman badge has a nice eagle design, however the specialty mark is less than desirable. Because they were traditionally hand-embroidered, two crows from the same supplier can differ. You might see various embellishments to the bird’s feathers or the beak. Some will have different colored bullion that can really make the bird stand out from the rest of the rate badge. A rare bird. This Radarman/Operations Specialist 2/c badge is not collectors can easily find. Bullion rates were for E-6 and above and this one is clearly not a cut-down E-6 rating badge. Other embellishments may include custom applications to the specialty mark. Variations to these embellishments pose challenges to collectors. Considering the Pharmacist’s Mate chevron (as seen at the top of this article), for example, one pattern could simply surround the red Geneva Cross with a single outline of thread while another could apply a crisscrossing pattern in addition to the outline. 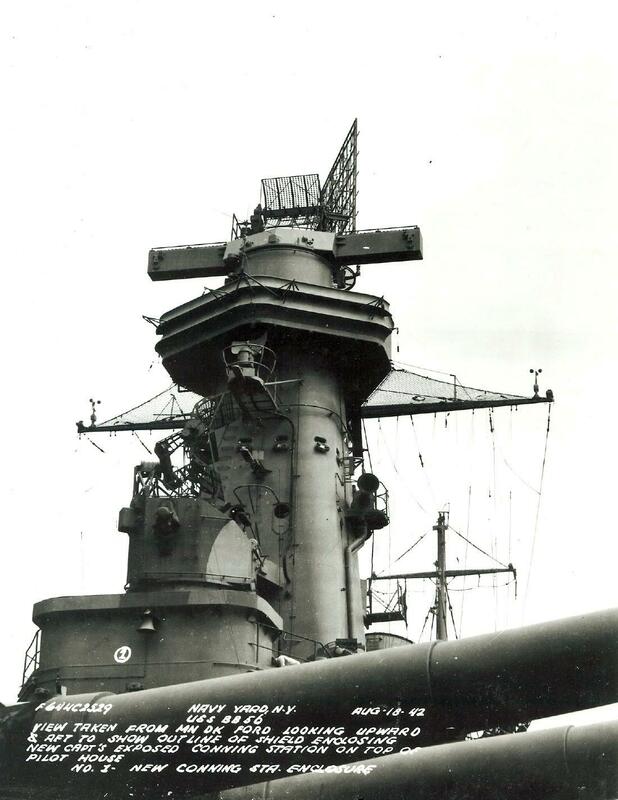 One example of a unique enhancement that I have seen was to a Machinist’s Mate crow that had a precious stone sewn to the center of the propeller insignia. The aquamarine tone of the stone really stood out against the silvery-blue bullion. This early Machinist’s Mate crow (right-arm rate) is embellished with a stone in the center of the propeller specialty mark (eBay photo). With the modern standardization of uniforms and insignia, the highly detailed and character-filled bullion crows are relegated to history (and to collectors). The current designs are sanitized, sterile and merely one-dimensional caricatures of the old patterns causing many navy rate collectors to shy away from them. Patch collecting is one of the most affordable aspects of militaria collecting and can be a highly rewarding venture to delve into the history and variations that are available. I am, by no means a serious collector of patches opting instead to be selective about the embroidered and colorful pieces of uniform history. , by John A. Stacey) so with today’s article, I am instead zeroing in on a specific design from a seemingly specific era. 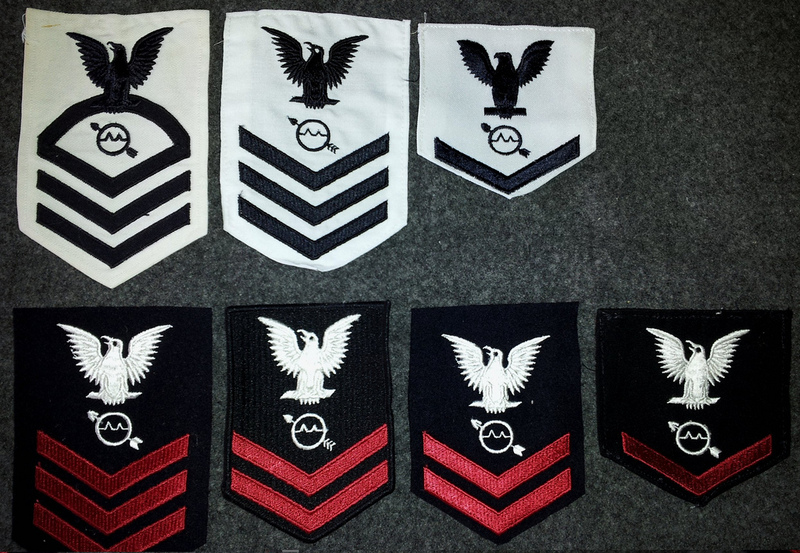 In the modern US Navy, rating badges are consistent in appearance and wear. From the design elements (eagle, specialty mark and chevrons) to the materials they are constructed from, they are all consistent. While this concept places emphasis on the uniformity of appearance and the unit-mindset (that all crew members work together as a single entity), it does restrict the ability for sailors to express and exhibit a measure of individuality and personal pride in their uniform appearance. The current rating insignia (in my opinion) have a rather sterile and sanitized appearance as they are all manufactured by a single source using one design pattern for each and every piece that is made. However, in previous years, sailors had much more freedom to instill their own spices into their uniforms. Rating badge collectors might focus their approach from casting a wide net (collecting everything that comes their way) to obtaining every single variety of a specific rating over the course of its existence. I find my collecting efforts to be even more specific as I seek only a handful of specialties (Radarman, Radioman, Ship’s Cook and Pharmacist’s Mate along with a few others) from varied eras (WWI-WWII) on select uniform choices (such as dress blues, whites or khakis). Though my choice of eras might seem rather specific, a closer look at the uniform regulations and the changes imposed during that time-frame reveals that the design of the ratings experienced several iterations. Dating back to 1886, the design (as cited in the uniform regulations) of the eagle called for its wings to be spread. The eagle’s head also now faced toward its left shoulder (having previously faced to the right) and would do so until 1941 when regulations then called for the head to point to the wearer’s front (regardless of the sleeve it was to be worn…more on that later). 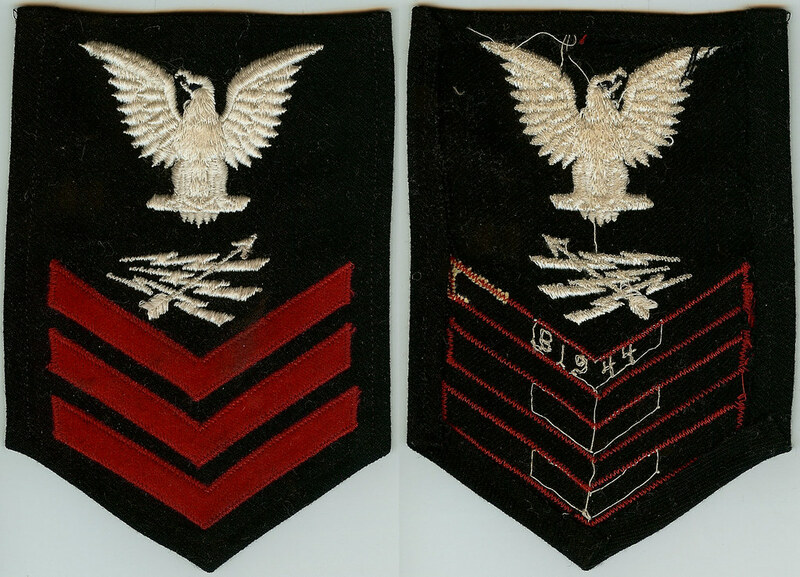 Prior to 1913, ships’ crews were divided into two watchstanding sections and were designated with terms that corresponded with the left (port) and right (starboard) sides of the ship which dictated which sleeve the sections’ petty officers would wear their rating badges. 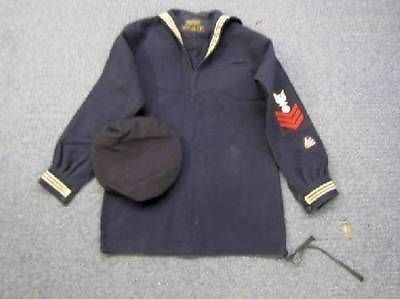 From 1913 onward, all petty officers whose specialties were in the Seaman Branch (such as Boatswain’s Mate, Coxswain, Gunner’s Mate, Turret Captain and Quartermaster) were right-arm ratings while all others in the Artificer Branch and Engine Room Force wore theirs on the left sleeve. What can make this confusing for new collectors is finding a rating badge (such as an electrician’s mate) with the eagle pointing toward the left shoulder. 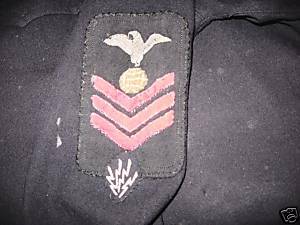 Finding this rating badge affixed to a dress blue jumper with it worn on the left sleeve would narrow the time-period down (given the embroidered pattern of the eagle had the eagle sitting completely vertical on the perch) to the inter-war era. 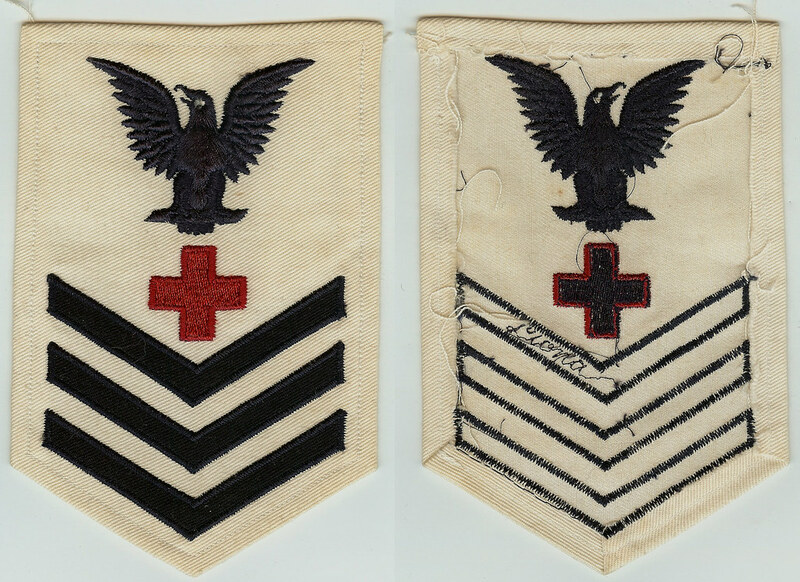 Though the practice started years before, during World War I, rating badges were customized by petty officers by trimming them from the traditional 5-sided shape (rectangle with the bottom corners cut away to form a point) to a contoured pattern. Fancy hand-stitching was then applied to follow the new shape (many times in the shape of a shield) providing a highly stylized appearance on the jumper shirt. As with many fads, this adornment fell out of practice as the Navy specified the pentagon shape and dimensions in a specific change (dated 16 February 1933) to the Navy Uniform Regulations. 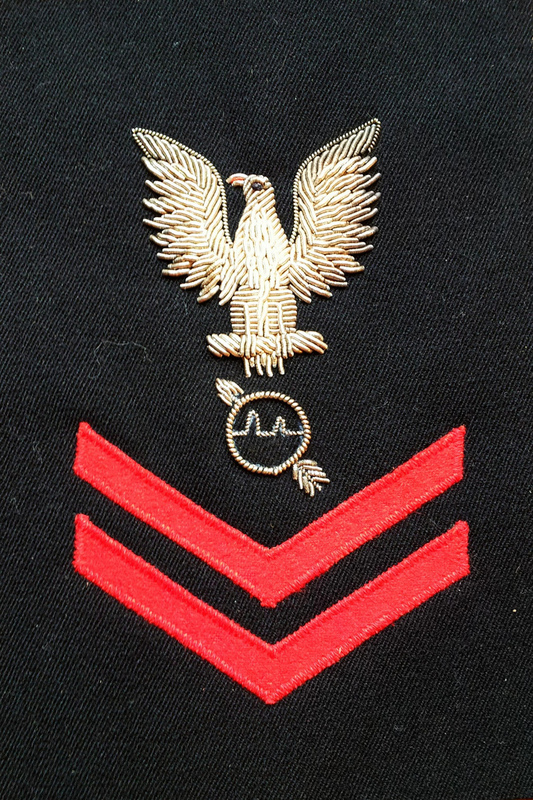 In 1941, the Navy changed the eagle to point to the wearer’s front specifying that all non-Seaman Branch petty officers’ ratings have the eagle look to its right shoulder (rather than to the left). The Seaman Branch (which had grown to include Fire Controlman, Mineman, Signalman, Torpedoman’s Mate). In addition to the eagle’s direction, the eagle no longer included the slouched (or leaning) posture that had existed for decades.Though there is no provenance to support this, the idea for these changes was to have the eagle positioned for fighting (facing the enemy and standing tall). Note the left-leaning eagle on this WWI-era Ship’s Cook second class rating badge. 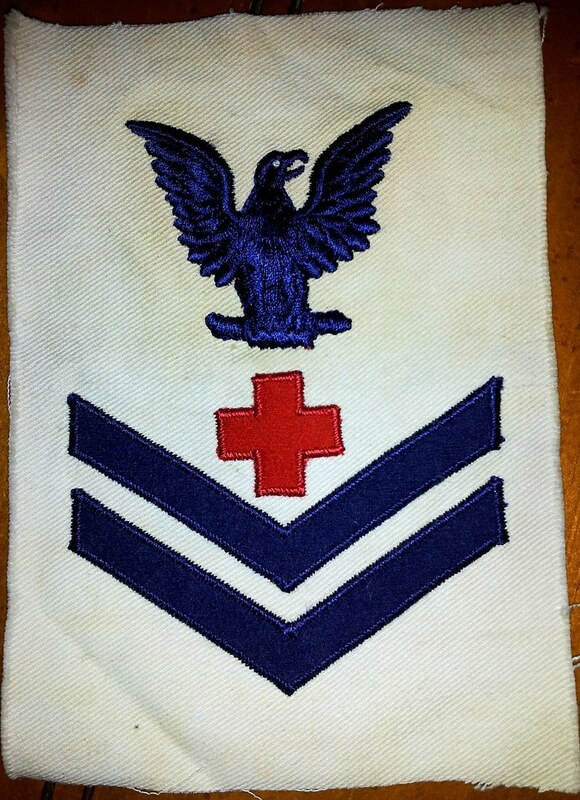 This dress white Pharmacist’s Mate 2/c rating badge is pre-1941 as noted by the left-facing eagle and its slight right-lean on the perch. During WWII, a handful of manufacturers provided dates embroidered directly onto the back of rating badges which nullifies the need for researching. 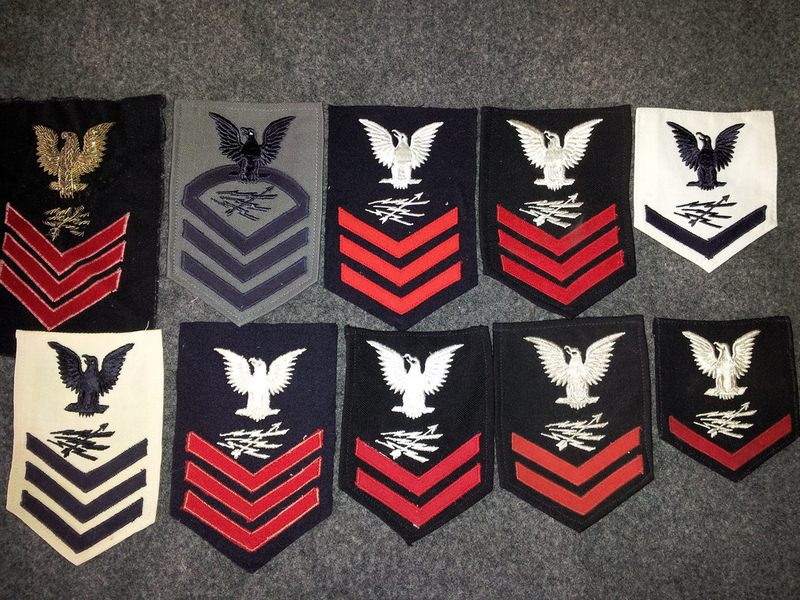 Following the release of the 1941 uniform regulations, the non-seaman branch ratings’ eagles were switched to face forward as the badge (as worn on the left sleeve). This Radarman 1/c was made in 1944 as noted by the embroidered date on the reverse. 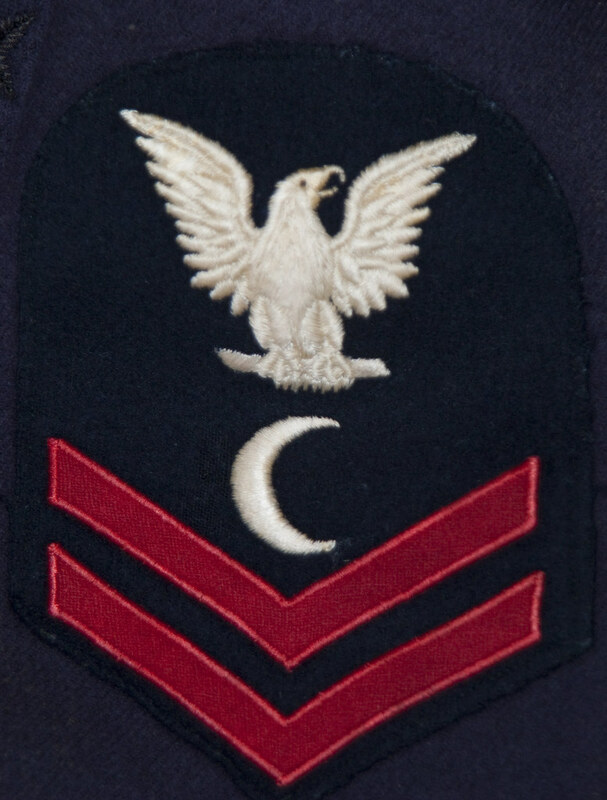 In 1947, the most significant change that indicated a desire for uniform appearance across enlisted ranks was moving all ratings to the left arm with the eagle facing forward. The distinction between the Seaman Branch and all other petty officers was removed. In the months to come, I will be providing additional articles in order to provide you with more insight into collecting rating badges and how to discern them without having to rely on others. All images are the property of their respective owners or M. S. Hennessy unless otherwise noted. Photo source may or may not indicate the original owner / copyright holder of the image.